They all approached from different angles. With Nessie arriving for drinks, there seemed to be lots of room so they sat down. Nessie didn't scare the waiters because they knew with the Wabbit, anything could happen. The Wabbit looked at Wabsworth and Wabsworth looked at Skratch. "I didn't like that red wind," said Skratch. "It woke me up." It was that kind of wind," drawled the Wabbit. "Makes your fur itch." "Yep," said Skratch, "everything goes screwy." "Well I'll ask the question." said Wabsworth. He hadn't sat down and looked like he was thinking. "What sort of screwy adventure was that?" he said finally. "Skratch smiled a film class smile. "It bounced around like a cork from a bottle of bubbly." "And then the cat got the cork," smiled Lapinette. Wabsworth put a word in. "Don't be so harsh. Despite its noir pretensions, it wasn't a genre piece. The wind drove it along like a screwed up chocolate wrapping." A light breeze played with the flowers in the pink vase, got bored and moved on. Skratch relented. "The wind is invisible but in the adventure the dust betrayed it. It gave it colour and ammunition." Lapinette's ears swayed gently. "The ghosts used the wind like a freight train and didn't pay." "Better charge it to the dust and let the rain settle it," roared Nessie. A spit of rain spread a damp bead on the tablecloth and it was quickly joined by another. 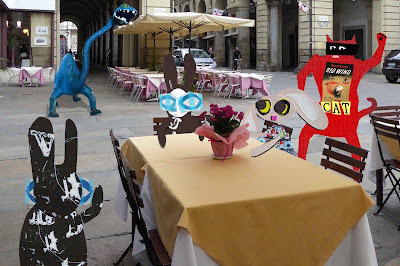 "The rain suggests we drink inside," said the Wabbit.